IRCTC Launches App For Booking Unreserved Tickets! The new IRCTC application has been developed by the Centre for Railway Information System (CRIS). IRCTC has launched an all-new app that will now allow you to book unreserved tickets online. The new mobile application called UTSonMobile will enable users to book and cancel unreserved tickets at any time from anywhere. The app also features a host of other facilities including cashless booking and renewals. The new IRCTC application has been launched by the Indian Railways. It will come with a number of facilities and features like issuing and renewing season tickets, booking platform tickets, checking and loading Railway Wallet balance, user profile management and booking history. 1 How To Download UTSonMobile App? 2 How To Register On UTSonMobile App? How To Download UTSonMobile App? The UTSonMobile is currently available on both, Android and Windows platforms. The application may be later will be made available on the iOS platform as well. The new IRCTC application has been developed by the Centre for Railway Information System (CRIS). The UTSonMobile app can be downloaded from Google Play Store or Windows Store for free. How To Register On UTSonMobile App? As you complete the registration, you will get a free Railway Wallet (R-Wallet) and other options within the UTSonMobile app. Developed by Centre for Railway Information System (CRIS), the UTSonMobile app is available for both Android and Windows smartphones. You can book your ticket on the UTSonMobile app and can travel without the hard copy of the ticket. The ticket will be available in the ‘Show Ticket’ section of the app which can be used a valid proof. After you register on the UTSonMobile app, you will get a free Railway Wallet (R-Wallet) in the app. It will be created automatically with a zero balance at no extra cost. You can use it for cashless bookings and renewals. Your Railway Wallet or R-Wallet can be easily recharged either offline and online. You can recharge your R-Wallet at any of the UTS counters or online through the recharge option available on the https://www.utsonmobile.indianrail.gov.in website. The new UTSonMobile also enables the issue and as well as the renewal of season tickets. You can issue a season ticket from the newly launched IRCTC app, and can also renew the same ticket from the app directly. You cannot book any advance ticket on the UTSonMobile app. The new IRCTC app does not allow you to book a ticket in advance, as the app only supports bookings and cancellations for unreserved tickets. The UTSonMobile app allows you to book any unreserved ticket on any route. 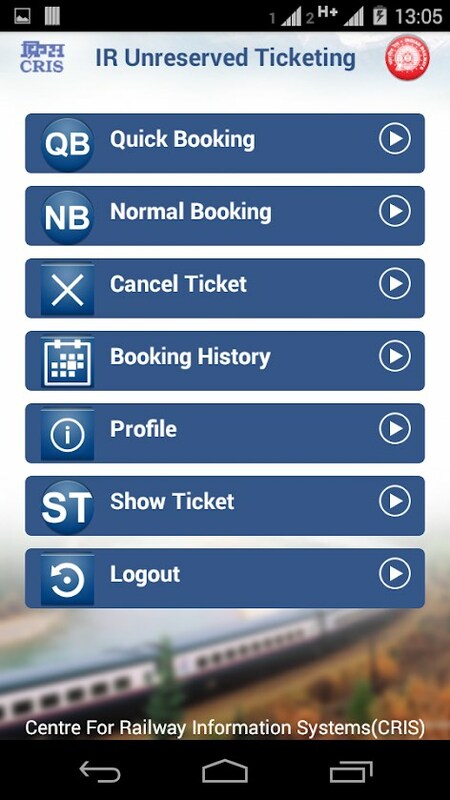 The new IRCTC app comes with all the unreserved ticketing options available on all the routes of Indian Railways. Apart from season tickets and daily unreserved bookings, the UTSonMobile app also supports booking of platform tickets. You can directly book a platform ticket on the app, and use it as a digital ticket from ‘Show Ticket’ section. The new IRCTC app developed by the Centre for Railway Information System (CRIS) will come with digital tickets. The UTSonMobile app will generate digitally supported tickets, and users no more need to have a hard copy of their tickets. The UTSonMobile comes with a cancel option as well. If you cancel an unreserved ticket within a stipulated time of booking, your ticket will be cancelled and the refund will be credited directly to your Railway Wallet (R-Wallet). The new UTSonMobile app will come with a user profile management feature. The new IRCTC app will help you to maintain a user profile with all your booking history, R-Wallet transaction history, frequently travelled routes and ticket type. "IRCTC Launches App For Booking Unreserved Tickets - 10 Things You Need To Know! ", 5 out of 5 based on 6 ratings.